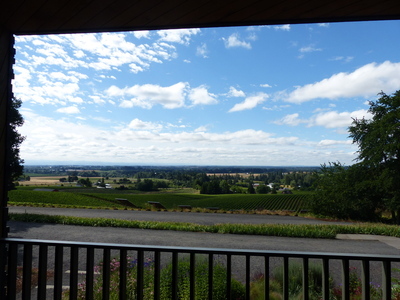 The view from the entrance to the Sokol Blosser Winery tasting room in Dayton, Oregon, photographed during an oral history interview with Alison Sokol Blosser on July 6, 2018, encompasses the vineyard, a solar array, and the surrounding Willamette Valley. Sokol Blosser was interviewed by Linfield College Archives staff Stephanie Hofmann. Linfield College Archives, "Alison Sokol Blosser Interview 01" (2018). Sokol Blosser Winery Oral History Interview Photos. Image. Submission 36.